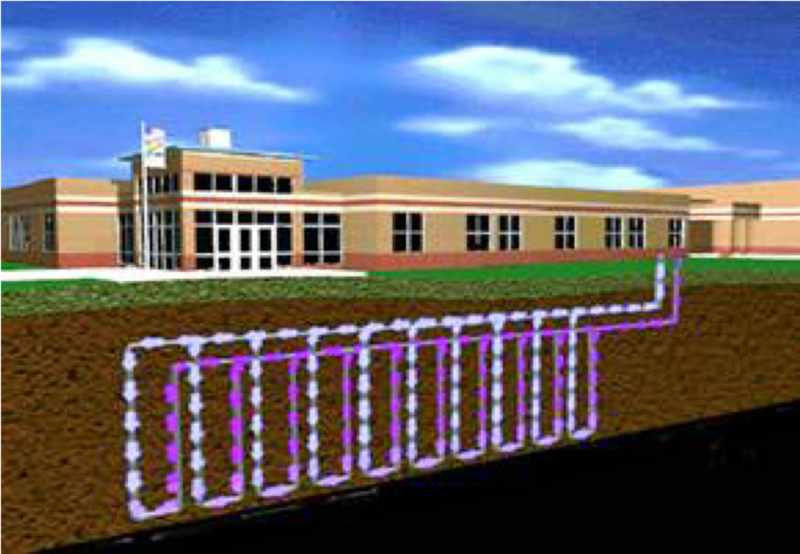 A geothermal heat pump, is a greatly efficient renewable energy technology that uses the temperature of the earth under the surface to provide heating and cooling. Geothermal heat pumps can reduce energy consumption up to 44% compared to standard air source heat pumps and up to 72% compared to electric resistance heating with standard air-conditioning equipment. Geothermal systems can save 40% to 70% on heating and 30% to 50% on cooling costs over conventional systems. Lower maintanence and longer life than typical HVAC Systems. The indoor components typically last about 25 years (compared with 15 years or less for a furnace or conventional AC unit) and more than 50 years for the ground loop. The system has fewer moving parts and is protected from outdoor elements, so it requires minimal maintenance - resulting lower maintenance costs. The Continuing Resolution spending bill signed by President Trump in the morning hours Friday, February 9, 2018, includes a measure to extend the geothermal federal tax credits for the industry-both residential and commercial. The initial renewal is at the same 30% rate for residential properties and 10% for commercial properties as was in place from initial passage in 2008 until they expired on December 31, 2016. The reinstated tax credits are retroactive to January 1, 2017 and extend to January 1, 2022. A special note of consideration for commercial projects is commercial projects are eligible for the tax credit if commenced by January 1, 2022. There is no maximum credit. You get the true percentage based on the year you install the Geothermal HVAC system. Systems must be placed in service on or before December 31, 2021. The geothermal heat pump must meet federal Energy Star criteria. All geothermal systems that we install meet this criteria. The tax credit can be taken on any home served by the geothermal system. It does not have the be the taxpayer’s main home. It can be a vacation home or rental home. Hope this article was helpful! Please contact us or click the link below to learn more about how Effectiv-Geothermal Design can save you even more!